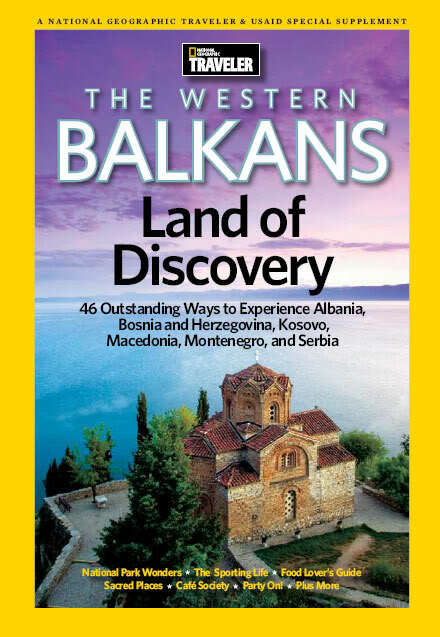 A National Geographic Traveler & USAID special supplement – The Western Balkans – Land of Discovery include 46 outstanding ways to Experience Albania, Bosnia and Herzegovina, Kosovo, Macedonia, Montenegro and Serbia. A crossroads and a crucible, where empires met, fought and combined to form a kaleidoscope of cultures unique in Europe; where the Greeks, Romans, Slavs, Venetians, Turks and Austro-Hungarians each left their own indelible mark on the architecture, cuisine, languages, music and traditions of the region. Medieval Orthodox monasteries, Renaissance Catholic churches, mosques and minarets stand together within the same city walls. The aroma of local food from the bazaars testifies to the fusion of East and West, while the region’s eclectic music and dance celebrate this rich heritage. The Western Balkans–Land of Discovery Geotourism website, created through a collaborative process, highlights the cultural, historic, and natural assets unique to this region. Through this partnership, the region benefits from the National Geographic’s considerable expertise. But the project could not work without input from people like you who know what makes this place truly unique and noteworthy.